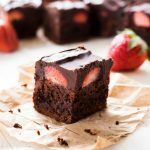 Chocolate-covered strawberry brownies are a decadent dessert made with fresh strawberries on top of fudgy chocolate brownies. My favorite form of chocolate is arguably brownies. Their dense, fudgy, chewy texture is just how I want my chocolate. With Valentine’s Day in sight, I decided to add some color to my brownies and topped them with fresh strawberries. When I think of romantic Valentine’s Day foods, chocolate-covered strawberries instantly come to mind. They’re fresh and sweet, but not too indulgent, but put them on brownies and you are in for a decadent dessert. Start with my fudgy chocolate brownies recipe and let them cool completely. 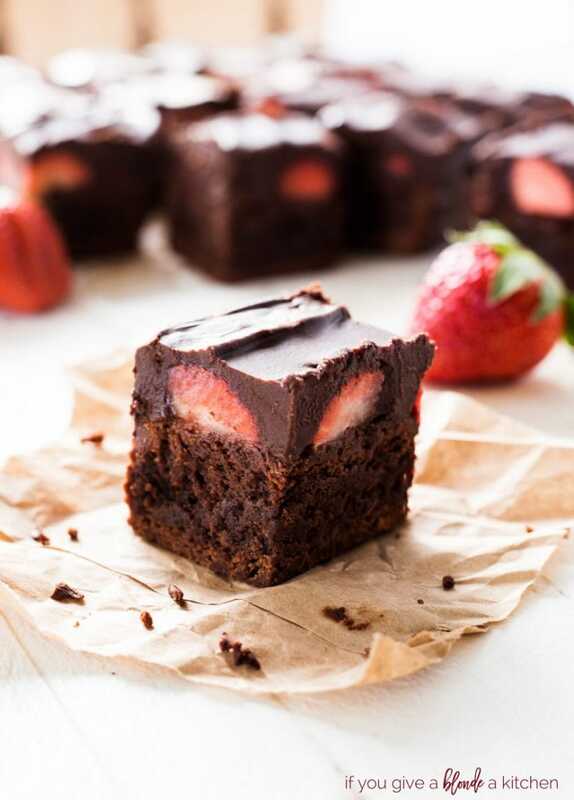 Top the cooled brownies with freshly cut strawberries and melted chocolate or chocolate ganache. Yes, it’s that simple! You could even used a boxed brownie mix if you’re in a rush, however, I’m always a fan of homemade brownies. They turn out fudgier and more decadent in my opinion. I originally developed this recipe in 2017, but I retested the recipe in 2019 and found that a chocolate ganache is a much more decadent topping for these brownies. Melted chocolate drizzled on top solidifies more and kind of breaks off of the brownie when bitten into. While they brownies still taste amazing, the process of eating the brownies isn’t as satisfying. Chocolate ganache (chocolate melted with heavy cream), however, stays a little soft and envelops the strawberries with decadence. The top chocolate layer is thick and rich, which complements the fruity strawberries quite well. Imagine biting into the fudgiest brownie you can think of. 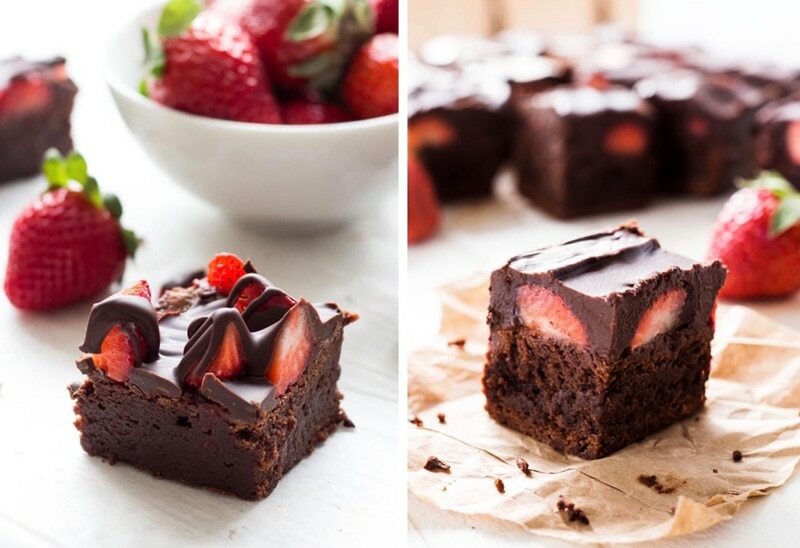 Now imagine that brownie topped with freshly cut strawberries and a smooth layer of chocolate. That is what these strawberry brownies taste like. Don’t you and your Valentine deserve such an indulgent treat? 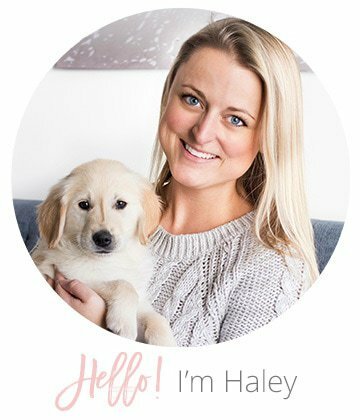 This recipe was updated January 2019. Instructions for melted chocolate topping are in the notes. Preheat oven to 350 F. Line an 8-inch square baking pan with parchment paper and set aside. Using a double boiler, or a medium heatproof bowl set over a pan of almost simmering water, melt the chocolate and butter, stirring occasionally until smooth (see tips for melting chocolate). Whisk in the cocoa. Set aside to cool slightly. Whisk together the eggs, sugar, vanilla and salt in a medium bowl until combined, about 30 seconds. Whisk the warm chocolate mixture into the egg mixture, then stir in the flour with a wooden spoon until just combined. Pour the mixture into the prepared pan, spread into the corners and level with an offset spatula. Bake 30 to 35 minutes, or until slightly puffed and a toothpick inserted into the center comes out with a small amount of sticky crumbs clinging to it. Cool on a wire rack to room temperature, about 2 hours. When the brownies are completely cooled, place strawberries cut side down evenly over the brownies. In a sauce pan over low heat, heat heavy cream until warm, about 2 minutes. Remove from heat and immediately, chocolate chips and stir until melted. If needed place back over heat for 30 seconds to help chocolate melt completely. Pour warm mixer evenly over the strawberries. When ready to serve, cut brownies into one-inch squares. Store brownies in an airtight container in the refrigerator for up to four days. Best when eaten within 24 hours. If you prefer melted chocolate topping instead, melt 1/2 cup chocolate chips with 1 tablespoon shortening in the microwave at 50% power level for 2 minutes. Stir every 30 seconds and remove from microwave when melted. Drizzle and let sit for 10 minutes until chocolate hardens. Cut and serve. Do you use bittersweet choice chips to coat the strawberries or does it matter? I used bittersweet, but you can use another chocolate if you prefer! I made these for Valentine’s Day – they are so fudgy and rich – husband and I love them. I plan on making them again this week for my “bring a finger food to share” for a birthday party we’re going to…but will give you the credit. To make them less messy to eat – I think I’ll cut the brownies smaller – put them on a parchment covered cookie sheet – then place half a small strawberry on top – and then drizzle the melted chocolate – to make them pop into your mouth size. It is strawberry season here in Florida – but still warm – so bite size will be better for a party. However, I have no trouble eating the finger licking good size at home! Thank you for sharing. Hi Mimi! I love that idea of cutting before garnishing with strawberries and chocolate. They will be perfect for serving to guests!